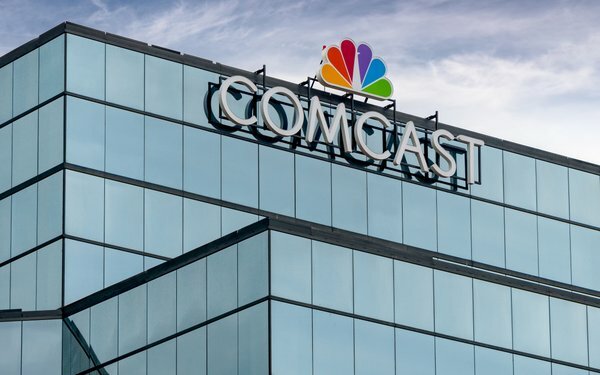 Comcast Corp. witnessed strong mid-to-high single-digit percentage revenue growth in the fourth quarter from most of its existing businesses. As a result, Comcast’s stock was up 5% in mid-day Wednesday trading to $36.71. The best results came from its high-speed internet business and NBCUniversal. Revenue at its cable communications group was up 5.2% to $14.1 billion -- with higher revenue earned from high-speed internet business (10% more to $4.4 billion), local cable advertising up 28% to $863 million), and business services (9.5% to $1.8 billion). Advertising was up nearly 30% in the period, mostly due to political advertising. Taking out political advertising, Comcast witnessed a 3.1% hike. At the same time, there was a decline in video revenue -- down 1.6% to $5.6 billion -- as the company continued to see lower residential video customers, with a loss of 19,000 in the period to a total of 20.96 million. NBCUniversal revenue grew 7.1% to $9.4 billion in the fourth quarter due to gains at its broadcast TV businesses (up 3.7% to $3.1 billion) and cable TV networks (8.9% higher to $2.9 billion). For the 2018 year as a whole, NBCU revenues were up 9% to $35.8 billion. In the fourth quarter, NBCU advertising revenue at its broadcast TV business were 2.1% higher and flat at its cable TV networks. Although ad revenue grew from higher local political ad sales, this was offset by audience ratings declines. Total broadcast TV revenues for the year gained 19.6% to $11.4 billion, largely due to having the 2018 PyeongChang Olympics and the Super Bowl, which both ran in the first quarter of year. The Olympics pulled in $770 million in ad revenues and the Super Bowl took in $423 million. Filmed Entertainment revenue grew 14% to $2 billion in the quarter, thanks to strong “Dr. Seuss' The Grinch” and “Halloween” results. Revenue from content licensing and home entertainment was lower. NBCU’s theme parks grew 3.5% to $1.5 billion as a result of higher attendance and higher average spending. Comcast’s pro forma results of its yet-to-be-completed acquisition of European broadcaster Sky would have shown an 8% increase in revenue for the year to $16.1 billion, with a 7% gain in advertising to $2.5 billion. Consolidated revenue -- when including its Sky acquisition -- climbed 26% to $27.9 billion, while net income to Comcast sank 83% to $2.5 billion due to unfavorable comparisons from the year before period, given tax benefits.